San José, CA – In Circus Xtreme the 145th edition of RINGLING BROS. and BARNUM & BAILEY CIRCUS, all the acts are extreme, magnificent, inspiring awe. Every single one of its performers is a star. 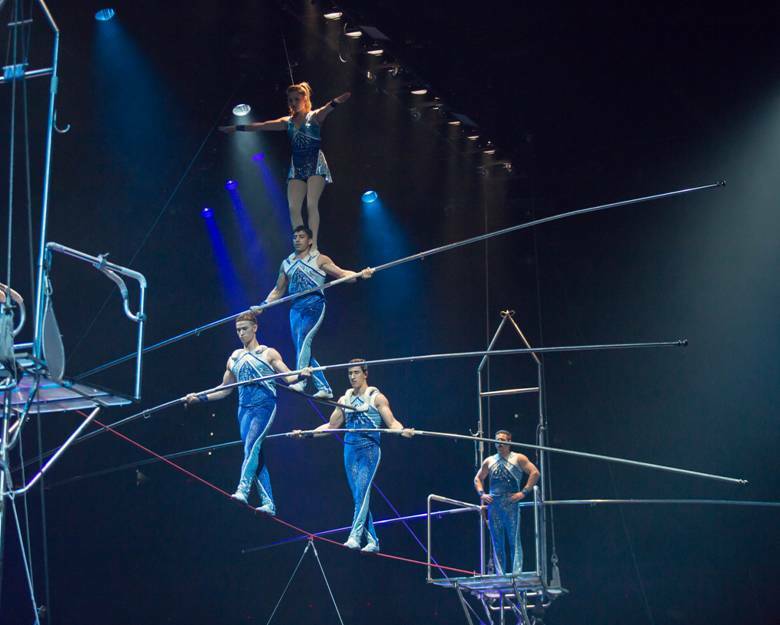 This year, “THE GREATEST SHOW ON EARTH” presents to its audience more dangerous, even life-threatening stunts where every single movement requires the absolute coordination of every one of its performers and the absolute control of their minds and bodies. We, "children of all ages", love the expectable which allows us to see the extreme of what a human body can do. Under the magic of the circus tent, the impossible is possible. One of those Xtreme acts is presented by the “DANGUIR TROUPE, ” a “Cuerda Floja” act performed by five “alambristas” (high wire walkers): MUSTAFA DANGUIR, ANNA LEBEDEVA, ACHRAF ELKATI, MOHAMED AZZOUZ and MIGUEL ANGEL PEREDA FERNANDEZ. Their act is unique and extremely difficult in which perfectly-coordinated the performers walk, jump over four people who are kneeling on the wire, and cross the wire forming a human pyramids of four people, with ANNA standing at the top. The Russian star even do splits. 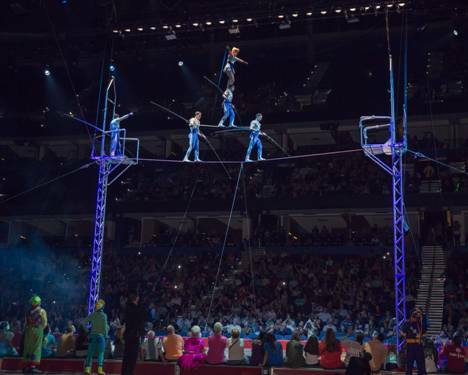 All these acts are performed on a wire, not wider than a human tumb, stretched 35 feet above the arena's floor. To learn more about their unbelievable act, CULTURAL WORLD BILINGUAL interviewed the artist who put the act together, Mustafa Danguir. He tells us that as a child he dreamed to be a Circus Artist, and that his career started when Father Silva, the founder priest from El Circo de Los Muchachos (The Circus of the young boys) saw him jumping in the beaches of Morocco. The priest from Galicia, Spain dream, was to create a place where marginalized kids from all over the world, could live and learn a trade. The priest saw the world as a huge pyramid with the well-to-do people at the bottom, the weak people in the middle and the children on top. So he educated them, trained them in a Circus’ art, and encouraged them to better themselves and try to do the impossible. Father Silva started his City for children in l956 in the City of Benposta, and invited everybody to be part of it. Sadly, only 15 youngsters showed up because most of the adults had forgotten how to dream. So the priest began his Circo de Los Muchachos school with these 15 children, training them in all the subjects children learn in schools and in Circus acts related to acrobatics. Since then, 50,000 children had been trained at his Circus School who now presents their Circus acts all over the world as is the second biggest Circus School after Moscow. Before realizing his dream of working with RINGLING, however, MUSTAFA compited in many competitions and won several World records for his “cuerda Floja” act.” His daring act included: crossing the Football Stadium in Santiago Bernabeu in Madrid, and a bicycle act (on the wire) en Benidorm Spain, starting at the top floor of the Grand Hotel Bali in the city and ending at the steeple of the highest church (a distance of a Mile at 540 feet above the ground) In Europe, he also crossed the Alexanderplatz, of Berlin, Germany. Here, in New York, he crossed, a l,l50 feet high wire extended between two mountains. Back in Europe again, in 2010, MUSTAFA walked from a mountain to the Highest hotel, in Europe. His dream now is to cross in his "Cuerda Floja" (as he calls his wire) each one of the seven World’s Wonders, on the world. C.W.B. What made you want to walk in the “Cuerda Floja?” we ask him. C.W.B. How old were you when you start training? M.G. “I was eleven years old, and my training started at the beach in Morocco, where jumping and somersaulting in the beach is a kids' sport. It was there where I was discovered by the late Father Silva, who offered me an scholarship and invited me to come to school at the Circo de los Muchachos in Spain. At the Circo, you can select if you want to be an acrobata, a malabarista, trapecista or a zonambulista (as they call the "Alambristas or wire walkers) I was attracted to the wire. C.W.B. How does the training start? C.W.B. How long it takes to learn to walk in a high wire? M.G. “All depends on the person. There are people who have the talent for it so in three years, with 5 to 6 hours of daily training, they could master the art. Others may take from five to seven years. Anybody can become an alambrista, but it is very difficult to master the art, and it is a very risky profession." C.W.B. How do you manage the perfect synchronization in your act? M.G. “With many hours of daily rehearsal. The problem in my profession is that you can not stop rehearsing for one day, because if you do, your body notices it. That is why you need to exercise every day, because you are training your body to balance itself on a wire and it has has to feel natural for you. Another thing I tell my partners when I am training them, is to think first in the other person, because, when you are an alambrista, you know that the other person is thinking about you.